Came in to buy a used car and was treated very well by sales representative Justin Miller. He was very knowledgeable about the vehicle and worked hard on the pricing process. If i return to this dealership i will look him up. We came in spur of the moment to look at vehicles. Patrick was very helpful from the start. Everyone that we came in contact with was helpful and friendly. They worked with us on our payments and options without any hassles. Since this is our second time buying a car from this dealership I will definitely recommend it to friends. I had a wonderful experience, Patrick and the manager were accommodating. I left with a car that I wanted. I am the proud owner of a BRAND new Tucson all thanks to Hyundai Cars Of Greenville! I have had the best experience of all time with this dealership. I was greeted by my name when I came in the second time. I have had the time of my life today Ben Ogle did everything and I do mean everything to get me in my Tucson and now it is mine! He is A Hyundai Professional I have sent people in the past to this dealership for service and now I will send them to buy their life time vehicle I am a Hyundai gal all the way now my family will be comming here also!! We called Hyundai Cars of Greenville to talk to someone about a few cars we saw online. Ben was very hepful and we set a time to come by to meet with him. He was very polite and helpful. He helped us get the best deal on a Sonata! We appreciate everything he did for us and plan on returning in the future. Thanks again! Patrick and everyone were really great!! It was quick and friendly service!! I will recommend Hyundai of Greenville to friends. I enjoyed working with Patrick Cook. He is a great person, he was very informative and made sure I understood the features on my Elantra. I will recommend Hyundai Cars of Greenville to all of my family and friends. The finance officer was great to work with as well. He did not rush me and answered all my questions. Being at the dealership was great in all car buying aspects. everone one was so nice. I will buy another one from and tell people about them. We had an absolutely wonderful experience with Hyundai Cars of Greenville. Ben Ogle was a no pressure, extremely positive salesman who really made us feel welcome. They were willing to work with our less than stellar credit and made us feel like valued customers! We highly recommend Hyundai Cars of Greenville and suggest you ask for Ben Ogle! The staff is really friendly and the process was quick and painless, I'm now the proud owner of a new 2015 Hyundai Accent. Patrick did a fantastic job!! He found the exact vehicle I wanted and explained all the features to us. We really appreciate his help and would definitely shop here again and recommend it to all our family and friends!! Hyundai Cars of Greenville's profile on Pinterest. Greenville Hyundai is committed to providing outstanding quality customer service. We have made a commitment to the highest quality standards in the automotive industry. It takes going above and beyond all competitors, and focusing, each and every day, on the hundreds of details that add up to an unparalleled automotive ownership experience. We focus on the little things to provide a high quality automotive buying experience to all of our customers because our highest priority is our customer, and we do whatever it takes to exceed their expectations. Greenville Hyundai allows every customer to post automotive reviews for all consumers to see and make an informed decision about our service and products. We know you have many choices to choose from, and we want to be your automotive dealer for life. Not only will you have the opportunity to post New and Used Car reviews, but you will be able to share how Greenville Hyundai treated you. We want to know how we did from the moment you were greeted at the door of our dealership, the automotive buying process, how you were treated in finance, until the time you drove your vehicle off of our dealership lot. Customer satisfaction is our job, and we love making our customers happy. 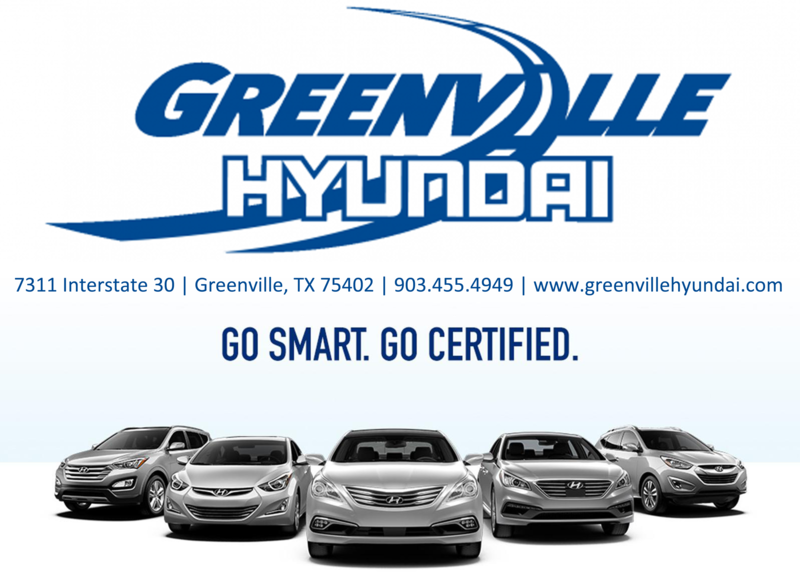 Greenville Hyundai is a top rated New and Used Car dealership in the Greenville, Texas Area. Greenville Hyundai is a member of the Rick Ford Dealer Group a leader in the automotive business for many years. Greenville Hyundai serves clients in Greenville and the Metro Area in Texas. We have put thousands of our customers into new or used cars, trucks, and SUV’s. However, it is not just about putting you in the right car, truck, or SUV; it is about where you are going in the best vehicle for your needs. Whether you are in the market to purchase a new or pre-owned vehicle, we'll help you find the financing options that work for you! Even if you have bad credit, or are a first time car buyer, you can trust that Greenville Hyundai will professionally fit you into the automobile of your choice. Greenville Hyundai understands you are looking for a strong value, and will find the best price that meets your budget. Exceeding expectations is what one will find at Greenville Hyundai sales, service, and parts departments. Please feel free to contact us at (903) 455-4949 if you have any questions or comments.